We are happy to announce the first in a series of events hosted by TCDS that will mark the 25th anniversary of the dismantling of the Communist system in Eastern and Central Europe. 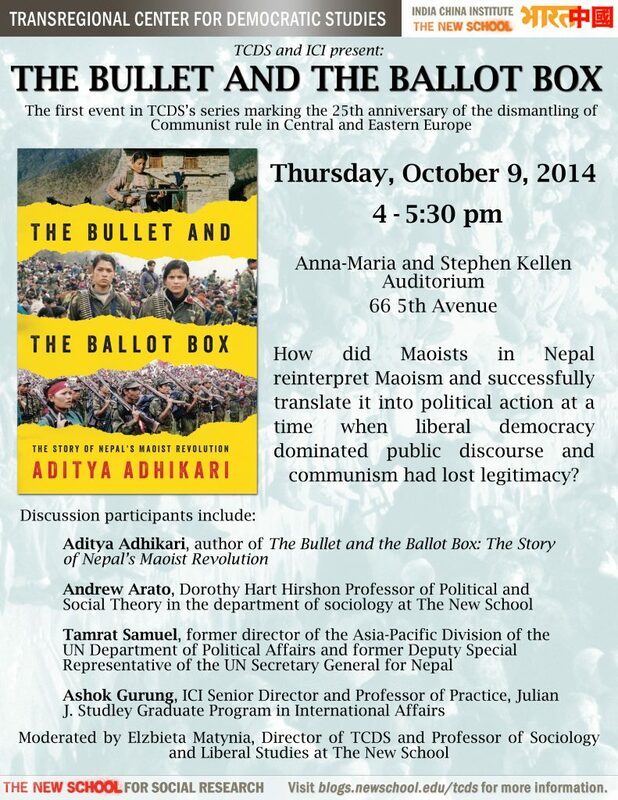 Organized together with the India-China Institute, The Bullet and the Ballot Box celebrates the new book with the same title by Aditya Adhikari, recently published by Verso. The Bullet and the Ballot Box will focus on the extraordinary case of Nepal, where an anti-autocratic movement partially inspired by the fall of the Berlin Wall led to the establishment of a multiparty system in 1990. However, this was soon followed by a Maoist armed rebellion (1996-2006) that swept the entire countryside. In 2006, the Maoists joined the political mainstream and multiparty democracy was restored. Following the historic election to the Constituent Assembly in 2008, the Maoists emerged as the most powerful political force in the country, and the monarchy was subsequently abolished. The discussion will focus on how Nepal’s Maoists reinterpreted Maoism and successfully translated it into political action at a time when liberal democracy dominated public discourse and communism had lost legitimacy. Ashok Gurung– ICI Senior Director and Professor of Practice, Julian J. Studley Graduate Program in International Affairs. ← Course List and Applications Now Available for 13th Democracy & Diversity Institute in Johannesburg, South Africa!